Composer Zenobia Powell Perry’s long lifespan witnessed momentous upheavals in the course of African-American music; when she was born in 1908, Scott Joplin still had nine years to live and when she died at 96 in 2004 Tupac Shakur had already been gone for eight. 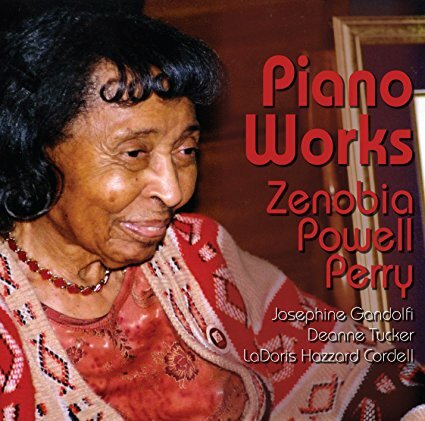 The music collected on Cambria’s Piano Works: Zenobia Powell Perry mostly belongs to the latter half of her life, from the ‘60s to the ‘90s, and is performed by three pianists: Josephine Gandolfi, Deanne Tucker and LaDoris Hazzard Cordell. Gandolfi and Tucker join forces on a duet arrangement (by Gandolfi) of music from Perry’s 1987 opera Tawawa House that is handily the most appealing and immediate music in the collection. Tawawa House tells the story of a mixed-race resort in Tawawa Springs, Ohio that served as the predecessor to Wilberforce College, the first historically black institution of higher learning in the United States. The dramatic potential of this little known subject, combined with Perry’s interest in the folk idiom of the era around the Civil War, moved her to write some especially exciting and engaging music for it. Perry held a long time composition residency at Central State University, which began within Wilberforce, and while some listeners may feel that Tawawa House smacks of Copland and/or certain William Grant Still pieces like Miss Sally’s Party, it strikes this listener as being in tune with the music of the French neo-classical school exemplified by Les Six, an interest Perry would have shared with Copland. That’s not to say that the rest isn’t equally captivating, but it’s more of a mixed bag. The seven pieces that open the disc are obviously for use in elementary music teaching and total to no more than eight minutes of the disc’s 54 minute playing time; their impression is rather slight, even the second time around. The more extended pieces outside of the suite are very interesting; Perry shares with Erik Satie a sort of disdain, or at least disinterest, in usual formal development schemes, though her gestures are linked through internal formal and thematic relationships that make clear that these are not transcribed improvisations, even if her choices are sometimes a little baffling, such as in the conclusion of Times Seven. Perry is strongly attracted to big chords and sometimes her textures are rather thick. In the 1930s, she assisted choral director William Levi Dawson at Tuskegee and her Homage to William Levi Dawson on his 90th Birthday attempts to take the standard accompaniment used at that time for spirituals into a more instrumental direction. Some listeners may find it heavy-handed, but it is a sincere and deeply felt creation, and that summarizes much of what is heard here. Beyond that, Piano Works: Zenobia Powell Perry is a little technically challenged; it has a couple of glitchy edits and is a very quiet recording overall, so be prepared to crank it up.